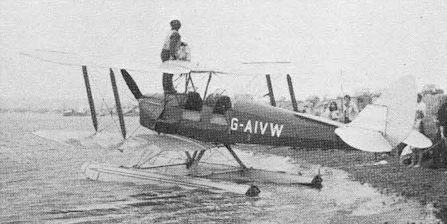 The sole Tiger Moth Seaplane in Britain, G-AIVW, obtained a renewed C of A during August 1971. The picture shows ’VW refuelling at Aldeburgh en route for a demonstration at the Oulton Broad regatta on 30 August. The D.H.82C floatplane, CF-FUG, was used by Tom Dow of Thunder Bay, Ontario, to attend the recent EAA Fly-In at Oshkosh, Wisconsin, and is shown on nearby Lake Winnebago.